Erica Bunker | DIY Style! 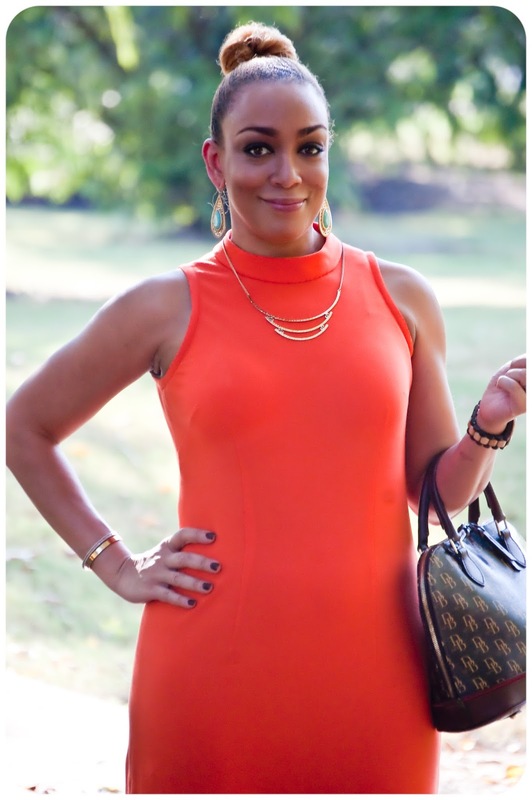 The Art of Cultivating a Stylish Wardrobe: Review: Vogue 9184 | A Wear Now and Later Dress! 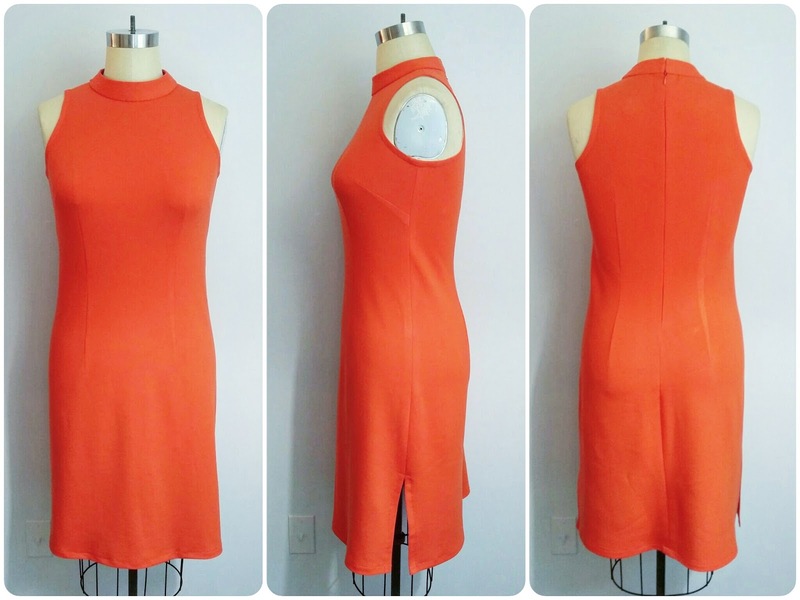 Review: Vogue 9184 | A Wear Now and Later Dress! 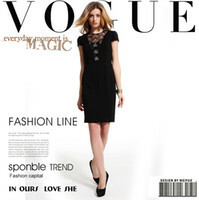 This is Vogue 9184. It's one of those basic Vogue patterns that you can do a lot with and that serves lots of purposes. It's a "Wear Now and Later Dress". It works now with sandals and it'll work in cooler months with tights, boots, jackets and coats. It's a simple sleeveless, fitted, slightly A-line dress that can easily work layered upon. When I first saw this dress, it was just "meh"... The short version on the envelope looked like it was done in a shapeless woven. I don't remember what the turning point was when I bought the pattern. It must've been me reading the fabric suggestions and seeing that a stable knit was on the list. 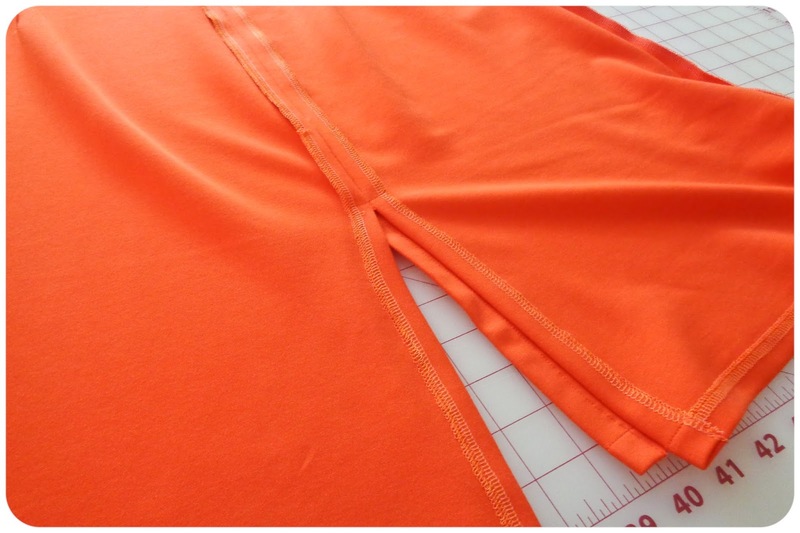 I picked this Mandarin Orange Lightweight Stretch Ponte Knit. 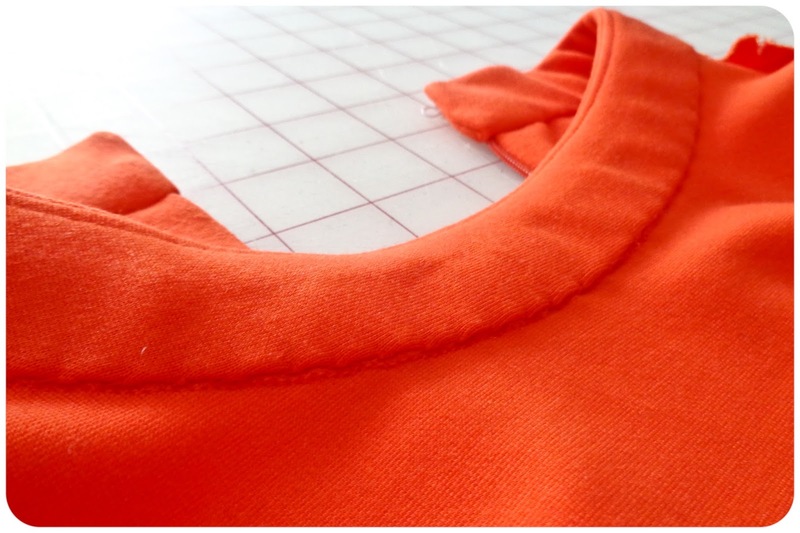 Ponte knit is one of my favorite fabrics to sew. It behaves beautifully. I cut the size 12 and graded to the 14 through the hips. I added 3" to the length. I'm pretty leggy. So after I did that, you can imagine just how high those side slits were. Very! So I had to shorten them by 3". My seams are serged and pressed open. Here is how the inside looks. The dress has a collar and the armholes are finished with bias tape. Here is an inside view of the collar. It's finished with a slipstitch. I know that a lot of you absolutely abhor handstitching, but it's a necessary evil in sewing and oftentimes gives the best and cleanest finish. Per my usual, I added interfacing to the zipper area. I will preach this each and every project with a zipper... it's necessary to do this. You might want to skip this step. But it really does make your garment look crisp and professional. And who wants a cheap looking or at the worst -- "Becky Homecky" looking wavy, wonky zipper? One of the biggest things about this dress is that it is lightweight ponte. It's not as "beefy" as what I'm use to. And in some aspects, it's pretty unforgiving. I had to be very thoughtful in what undergarments I picked to wear beneath it. I suggest a well-fitting t-shirt bra. It gives smooth lines front and back. And perfectly seamless underwear that won't cut into you in those fleshy/meaty places that we all have. This dress is such a favorite. I'll be making one in black and probably winter white as well. And Mikaela has already put in requests for a couple in her size. I'm happy now! I can relate to your current makes here in the north of England where it's never warm enough for your summer sewing. This is fabulous on you, deceptively simple in design which means it has to be beautifully sewn. You look so toned! I would never have looked twice at that pattern, but the dress is stunning on you - beautiful sewing ! It's one of those patterns that you have to stare at the technical drawing and see the potential! Thanks Gabrielle! Erica, you always have such wonderful taste! Sewing is a work of art. Thank you so much DK's Wife! Beautiful! I love that color and the idea of using ponte. Ponte is my all time favorite knit. Thanks Jenny! Gorgeous color on you and it looks fabulous! That is a gorgeous dress. I love orange and ponte knit. This pattern definitely when from "meh" to "wow". Very beautiful! I wouldn't have looked at this pattern either, but you've made me want it. This color looks so great on you. Oh I almost got this pattern but decided not to as I think it would not work for my figure. Your dress is stunning. I love the vibrant orange color which complements your skin tone beautifully. You certainly make this pattern sing! Ooh, I love that color and wish it were half as flattering on me as on you! 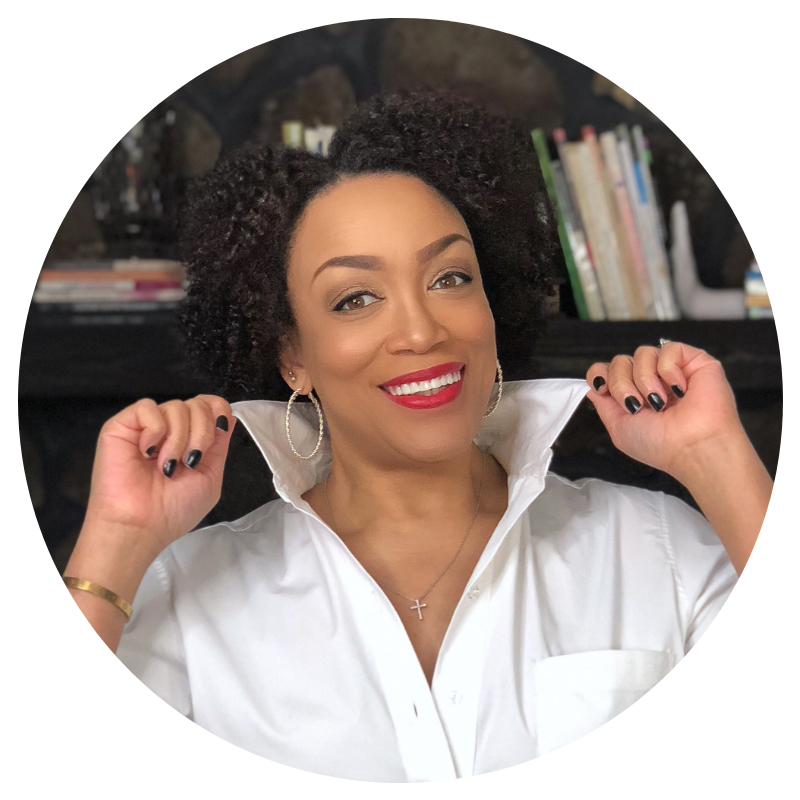 Great collar on this one -- adds sophistication without looking stuffy. I know, right! It's real though! Awesome! What a pop of color! Thank you for all of the tips and suggestions. Question: Do the directions instruct you to interface the zipper area, or is that just something you know to do? 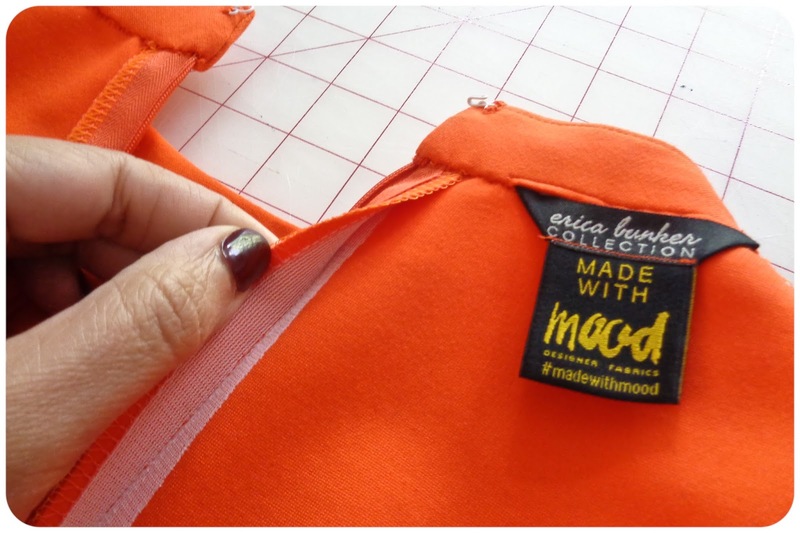 I don't know that I've come across instructions regarding interfacing the zipper area and I'm wondering if I should just start doing that for all my zippers. Can you talk a little bit more about this please? I know to do it. Some more advanced Vogue designer patterns suggest it. I've recently talked about this in detail. See the post below of the white dress. Thanks Carmen! This is so stunning, I'm thinking I might need to copy you!! That color!!! And I can't agree more about interfacing the zipper opening - same goes for me for pocket openings. I'm always annoyed that more patterns don't suggest this! I'm such a stabilizing junkie. I wish more patterns would include this. Thanks Sallie! Beautifully done, and thank you for the tip on putting Interface to the zipper area. I've been struggling with zippers on knits. Beautiful dress and I love the color! I'll have to check the pattern out; it really is a versatile basic that can help build essential wardrobe pieces. P.S. Your preaching about interfacing the zipper area has reached my ears! 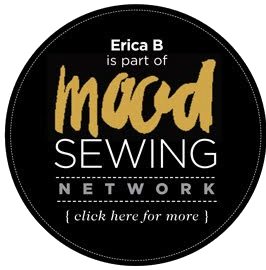 I can attest that Erica Is Correct! Vogue Patterns | Winter/Holiday Release! Hello to Fall with Mustard and Chocolate! Flared Sleeves and Flared Pants for Fall 2016!